In my recent post on the harmonic major scale, I talked about ways to construct II-V-I lines using one single scale. I have also mentioned the harmonic minor scale in passing when talking about minor II-V-I’s. In this post, I want to cover more in depth the main way the harmonic minor scale is often used over II-V-I’s. I kept this as a separate post because the harmonic minor is so specialized that it deserves its own dedicated post. 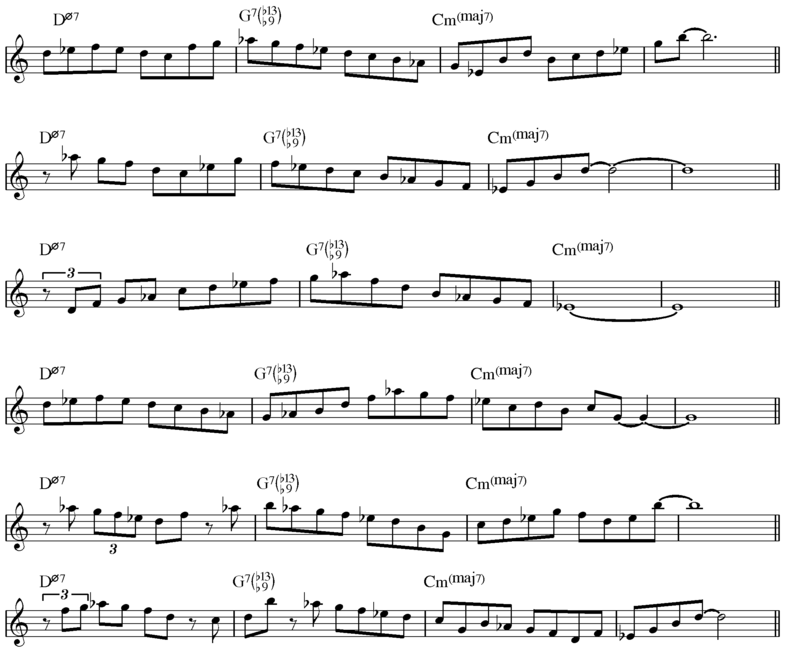 The harmonic minor scale is used a lot in jazz, especially in vocabulary from the bebop and hard bop eras (the melody to “Donna Lee” is just one example). You can read my recent post for a recap of what the harmonic minor scale is and how it’s derived. When you use this scale over a minor II-V-I in C minor, you end up with a D Locrian (natural 6) scale over the II (half dim.) chord, a G Phrygian (natural 3) scale over the V7 chord, and C Aeolian (natural 7) – the tonic harmonic minor – over the I- chord. The harmonic minor is perfect for generating hip II-V-I lines because it has the b9 and b13 of the V7 chord embedded in it and it allows you to simplify the entire II-V-I into one single reductive scale. It works over all three chords and has a strong sense of tonality and unity. In addition to simplifying the way you think about a II-V-I, the harmonic major automatically liberates you from that often droll “church mode” sound and gets you playing a hip, “exotic” sounding scale. The harmonic minor scale works great over minor II-V’s. To use it, simply play the harmonic minor scale built off of the root of the tonic or root of the I chord – so for a minor II-V-I in C minor, play a C harmonic minor scale. I hope you find this helpful and inspiring, and I hope you feel empowered to go out and practice and explore the harmonic minor scale! In how to use Harmonic minor…. Hi Jean-Claude! Thanks for pointing that out and taking the time to help us. Fixed!